My mother and my father like to tease me because I collect cookware. My father once even went so far as to call me “the Imelda Marcos of dishes”. But my parents have a waffle cone maker, and even I don’t own a waffle cone maker. Never mind the fact that they only have this waffle cone maker because I gave it to them as an anniversary gift, can you believe they have a fun kitchen toy that I don’t? 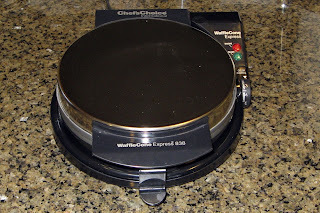 I just had to do something about this inequitable situation, so I got myself a waffle cone maker too. 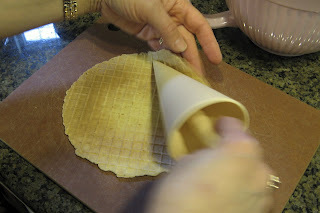 And Mom sure does make good waffle cones. 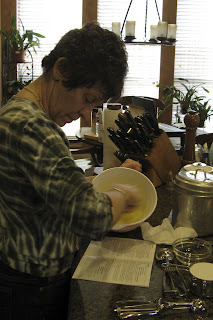 In the blink of an eye, she whipped up the batter. She puts out the cones by the numbers. The only tricky part is making sure that there isn’t a hole in the bottom for the ice cream to drip out of. Make that homemade vanilla bean ice cream. Now, I think that’s fair. Wowo you made this at home. Super. I am sure they were yummy yumm. Mmm, waffle cones...I remember going to a Ben & Jerry's one summer for a job interview, in the morning before they opened. 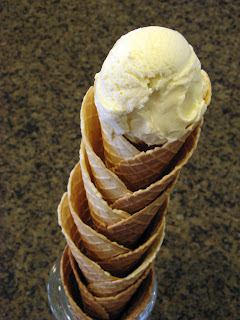 They were making the waffle cones while I had my interview and my hair smelled like waffle cones all day! It was odd but nice. Wow! 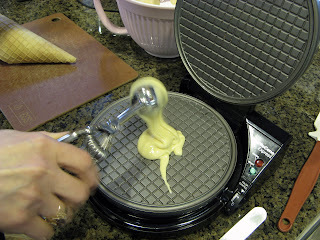 If I ever get a waffle iron I'm totally going to make these. 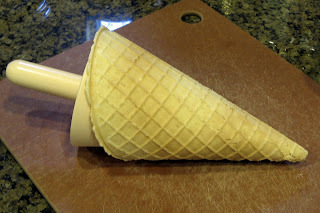 One trick we used as kids for cones with holes at the bottoms was to stick a mini marshmallow down there to plug it up. Just in case!